There is a lot of competition in the world of VPN, making relative newcomer Kepard’s quick rise to being considered one of the top services that are available. Today’s internet climate is one of suspicion—and rightfully so and identity theft continues to increase and identity thieves become more creative. This has made many people make the move toward using services that will protect the information that they use during their internet activities. 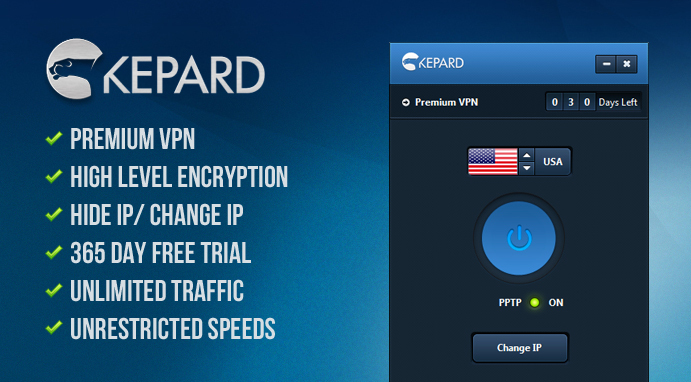 This is where VPN service comes into play, and how Kepard can provide tremendous piece of mind. The price of services is often a major factor when consumers are considering making a purchase, and VPN services are no exception. Pricing for Kepard is competitive, and organized in a structure that is easy to understand so it is simple for you to review the options and choose the one that is appropriate for your needs. With a free trial you will have access to the premium servers offered by Kepard, this trial will have some restrictions. The premium version provides both unrestricted speed and unrestricted traffic. You have the option of choosing either a monthly plan that is priced at $7 per month, a three-month structure for $19, or an annual plan for $69. It is so simple to get started. All you need to do is enter your email address, choose a unique password, and provide your payment information and you are on your way. Fortunately they also make payment easy—happily accepting not just Discover, Visa, MasterCard, and Amex credit cards but also the extremely popular payment service PayPal. This means that you can use the type of payment that is most convenient for you rather than trying to adhere to the restrictions of a company. Now, with Kepard referral program you can earn up to 6 months of Premium VPN when you invite your friends to Kepard. For each friend you invitem, they reward you with 1 month Premium VPN. It’s simple, you just open an account and start to invite your friends, you don’t spend a cent. It is a great opportunity to try Kepard services. 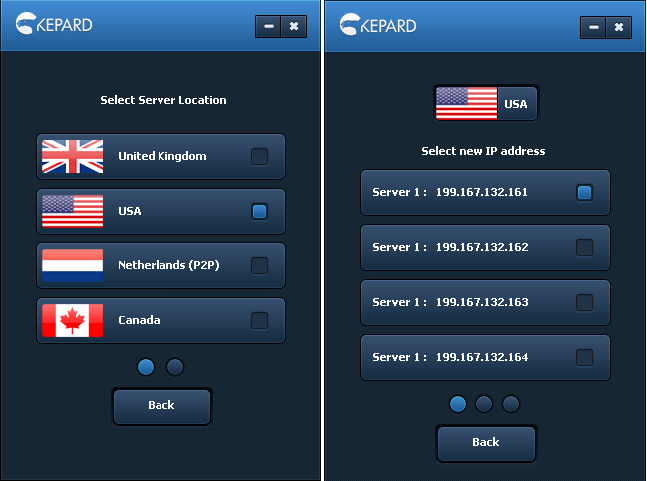 Knowing that internet activity is not restricted just to one place in the world, Kepard has spread to provide servers in major countries including Germany, Canada, the United States, Netherlands, and the UK VPN To keep you up to date on when new server locations are offered by the VPN, Kepard offers automatic updates. Kepard is making an effort to offer customers the most widely used and preferred protocols, despite the fact that these protocols are not often offered by those companies that support international servers. 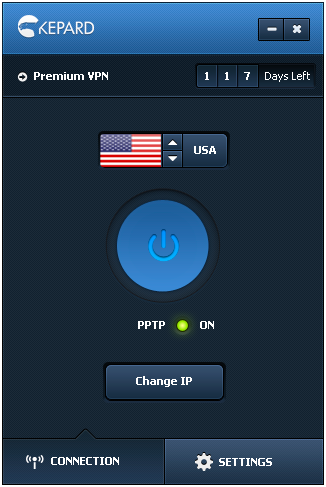 Through this company you will have access to OpenVPN, L2TP, and PPTP. You can also feel confident that your internet traffic is securely through the encryption of protocols such as L2TP/IPsec. This will protect not only your identity but all of the other sensitive information that you may transfer and record when on the internet. Customer support is a vital part of any company, and Kepard strives to provide attentive, approachable support. They are dedicated to continuing to expand their support options as the company and client base grows. Once you are a client you will also be able to get in touch with Kepard’s customer support resources through the control panel on your site. The website allows offers a Support area that provides the answers to consumer Frequently Asked Questions, information about becoming an affiliate, and instructions on changing your settings. This will help to solve many issues quickly and easily. They also proudly offer support 24 hours a day every single day of the year, which is truly amazing for a company that offers such expansive international services. Though Kepard has made no mention of offering a money back guarantee on their services, such a guarantee isn’t really necessary considering the impressive free trial that they already offer. Such a free trial is plenty of opportunity for you to try out what Kepard has to offer and decide if the services are right for your needs. The internet is a massive, incredibly complex entity full of opportunity. Unfortunately, there are many places and situations that can limit your options and reduce your anonymity. You may find that when you are in certain places you are not able to access sites such as YouTube or your favorite social media platform. Kepard helps you get around this. With these services you have available to you unlimited traffic and the ability to access web space that would otherwise be restricted. As long as you are utilizing a server that is close to you, you should not experience any reduction in speed when using the VPN. If circumstances force you to use a server that is further away from you than is ideal, the speed difference should not be tremendous. You may not even be able to notice that your system is running any slower unless you use an actual speed test. Kepard is supported on a wide variety of devices, making it accessible to a tremendous customer base. Any device that utilizes an operating system listed on Kepard’s supported list will be able to use the features of Kepard. This ranges from laptop and desktop computers to iPhones. It is very simple to install the Kepard network, but if you find yourself having issues you can take advantage of the Customer Support offerings of the Kepard support channel or submit a personal support order to the staff. The operating system that your device uses makes an important impact on the capabilities of that device and what services it will be able to use. 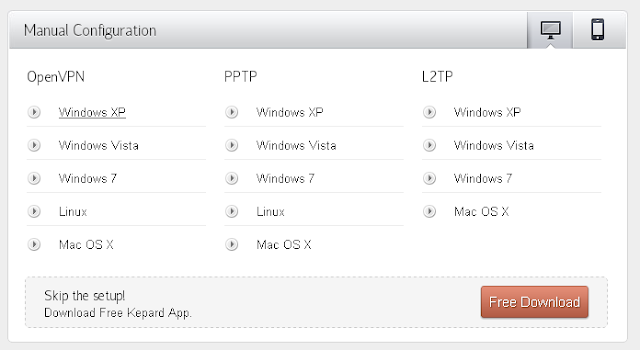 Kepard supports all of the major operating systems, including iOS, Android, Windows, Linux, and OSX. This even means that you can use your smartphone! Because internet users have a wide variety of preferences when it comes to Internet browsers, it is important to note that Kepard works beautifully in browsers including Firefox, Safari, Chrome, IE, and Opera. 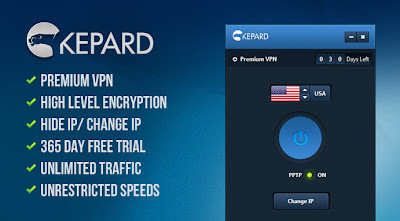 There are a lot of people in the “I have to see it before I’ll believe it” camp, and to address their needs, Kepard offers an impressive free trial. Just by going through a simple sign up process you can take advantage of Kepard VPN for a full year. You will be able to experiment with it enough to determine if this is the right service for you. You should realize that for the purposes of this free trial, you will be restricted to 30 minutes of daily use. When you decide that this is the right service for you all you need to do is make the easy switch over to the Premium service. 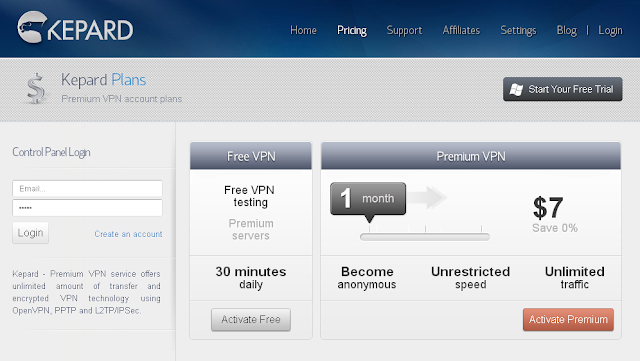 There are other options for VPN, but there is nothing that those services can do that Kepard cannot. This company truly sets itself apart through its range of services, including the list of protocols that it supports and phenomenal customer support—including an intuitive approach to problem resolution that starts with detection of lost connections and rapid action. Your capabilities while using Kepard are truly amazing. You can access a full range of settings, server locations, and even protocols simply. With just one click of your mouse you can make changes and connections, and even use different computers. The use of a NAT firewall is effective in preventing spammers and other inscrutable figures from compromising your information or your connection. Kepard is still young, but at least for now it is a user-friendly, approachable, and affordable option for VPN services.